For once, Cork was not visited by some terrible natural disaster on the eve of its annual tournament, as it has been in recent years. 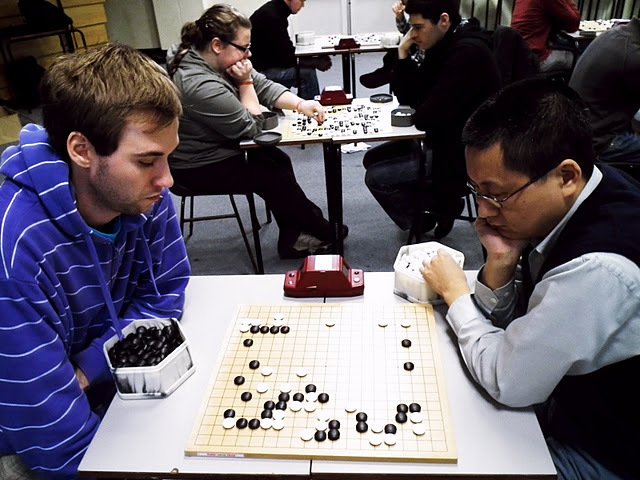 The 2011 UCC Weiqi Tournament was won by Kim Ouleween (left), a professional artist from Amsterdam who’s done some game commenting on EuroGoTV. His 5-game sweep kept the tournament in Dutch hands for the second year in a row. In second place on tiebreak was KGS star Ian ‘Javaness’ Davis, who collected more SOS than Spain’s Matei Garcia. Also winning 5/5 was Thomas Shanahan from Galway. The 23 players were all grateful for organiser Justyna Kleczar’s hard work.